Details of John Hendry\Hendrie and Agnes Fraser and their children where known. There is a possibility that this family link to my Williamson tree on the basis that this couple had a daughter Agnes born on 6 April 1784 in New Monkland who would fit as the Agnes Hendry who married Alexander Williamson (my ggg grandfather) in the January of 1804 in New Monkland. For further details - Click Here. Certainly her age would be appropriate and the Agnes who married Alexander Williamson is named on her headstone in Airdrie as Agnes Hendry . The family of John Hendry and Agnes Fraser also seem to have used the"d" although also being recorded as Hendrie on some occasions. No marriage date has been found for John and Agnes but I suspect it would have been in the 1770's making their respective births likely to be circa 1745. Alexander Hendrie born about 1781 in New Monkland, Lanarkshire. Agnes Hendry born 6 April 1784 in Shankly Farm, New Monkland, Lanarkshire. Margaret Hendry born 6 June 1786 in Shanks Farm, New Monkland, Lanarkshire. Charles Hendrie born 10 April 1791 in Bankhead Farm, New Monkland, Lanarkshire. Robert Hendrie born 2 June 1793 in Gartmillan Farm, New Monkland, Lanarkshire. Nothing is known of John and Agnes other than the births of their children, so should anyone be able to supply further information, or possibly prove that their daughter Agnes was not the lass who married Alexander Williamsom, this would be appreciated. Please use the contact form available at the top of this page. Alexander Hendrie born about 1781 in New Monkland, Lanarkshire, the son of John Hendry, a Farmer, and Agnes Hendry, maiden surname Fraser, as identified on his later death certificate. Alexander married Janet Bell on 28 May 1806 in Barony, Glasgow. This was possibly the Janet Bell born 8 March 1783 and baptised 16 March 1783 Barony, Glasgow to George Bell and Elizabeth Martin. John Hendrie born 3 May 1806, and baptised 1 June 1806, Barony, Lanarkshire. George Hendrie born 21 December 1807, and baptised 22 December 1807, Barony, Lanarkshire. Twin to Elisabeth and like Elisabeth may have died young as second George born 8 years later. Elisabeth Hendrie born 21 December 1807, and baptised 22 December 1807, Barony, Lanarkshire. Twin to George and like George may have died young as second Elisabeth born 16 years later. Agnes Hendrie born 4 November 1808, and baptised 13 November 1808, Barony, Lanarkshire. Nothing more currently known. Margaret Hendrie born 31 December 1810, and baptised 13 January 1811, Barony, Lanarkshire. Alexander Hendrie baptised 14 February 1813, Barony, Lanarkshire. Possibly died young as second Alexander born 4 years later. George Hendrie born 7 June 1815, and baptised 25 June 1815, Barony, Lanarkshire. Nothing more currently known. Alexander Hendrie born 24 January 1817, and baptised 23 February 1817, Barony, Lanarkshire. Nothing more currently known. Janet Hendrie born 21 December 1818, and baptised 10 January 1819, Barony, Lanarkshire. Charles Henry born 26 September 1820, and baptised 29 October 1820, Barony, Lanarkshire. Nothing more currently known. Elisabeth Henry born 2 July 1823, and baptised 20 July 1823, Barony, Lanarkshire. Nothing more currently known. For the census of 1841 Alexander was farming at Westmuir Farm, Shettleston. It is assumed that the Janet aged 55, and the two girls Janet and Elizabeth aged 15 (ages rounded down to the nearest 5) included in the household, are in fact his wife, Janet, and their two younger daughters, Janet and Elizabeth. However the Alexander aged 12 is almost certainly his grandson, son of his eldest boy, John, and his wife, Agnes Duncan. For the census of 1861 Alexander was recorded as aged 80, a Widower, living at 5 Morrison Place, Calton, working as a Gatekeeper in an Engineering Works. A search of the BMD Indexes for 1855 - 1861 for the death of a Janet Hendry\Hendrie\Henry, maiden surname Bell did not find any entries which suggests that Janet had passed away sometime between the census of 1851 and the start of Statutory Registration in 1855. Although not entirely legible Alexander's surname does seem to be written as Alexander Handen . However it is actually confirmed as Alexander Hendrie by the presence of Alexander's married daughter Janet H. Kelly and her husband Thomas Kelly. Janet had married Thomas Kelly 23 November 1860, High Church, Glasgow, Lanarkshire, and their their one and only known child, Janet Hendry Kelly born the year before this census on 21 March 1860 in Bridgeton, Glasgow, Lanarkshire, was also included in the household. Alexander Hendry died aged 85 on the 5 November 1866 at 6 Morrison Place, Calton, Glasgow, Lanarkshire. The death certificate recorded him as a Farmer, the widower of Janet Bell and the son of John Hendry , a Farmer, and Agnes Hendry, maiden surname Fraser, both identified as deceased. The informant was James Hendry, Grandson. The Glasgow Herald of 6 November 1866 carried a notice of Alexander's passing. There is a possibility that this Agnes was one and the same as the Agnes Hendry who married Alexander Williamson in the January of 1804. Certainly her age would be appropriate and the Agnes who married Alexander Williamson is named on her headstone in Airdrie as Agnes Hendry . The family of John Hendry and Agnes Fraser seem to have also used the"d" although also being recorded as Hendrie on some occasions. If you believe you may be able to provide further information, please get in touch using the Contact Form which can be accessed via the top of the page. 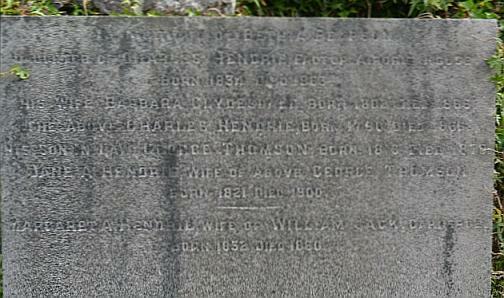 For further details of the Agnes Hendry who married Alexander Williamson - Click Here. The birth of Charles Hendrie to John Hendrie and Agnes Frazer was recorded in the New Monkland Old Parish Register on 10 April 1791 at Bankhead Farm, New Monkland, Lanarkshire. Although the later death certificate of the Charles Hendry documented hereafter does not supply his parents names, I am confident they are one and the same, due to his age and place of birth on the various censuses plus his naming a daughter Agnes Fraser Hendry. Alexander Henry born \ baptised 11 July 1820, New Monkland, Lanarkshire. Jane Henry born \ baptised 14 April 1822, New Monkland, Lanarkshire. John Henry born \ baptised 21 December 1823, New Monkland, Lanarkshire. James Henry born \ baptised 05 June 1825, New Monkland, Lanarkshire. William Henry born \ baptised 18 June 1827, New Monkland, Lanarkshire. John Henry born \ baptised 27 September 1829, New Monkland, Lanarkshire. Margaret Henry born \ baptised 13 November 1831, New Monkland, Lanarkshire. Bethia Pierson Henry born \ baptised 13 April 1834, New Monkland, Lanarkshire. Agnes Hendrie born \ baptised 03 July 1836, New Monkland, Lanarkshire. Christina Hendry born \ baptised 20 March 1839, New Monkland, Lanarkshire. For the 1841 Census Charles was recorded at Airdrie House, in Airdrie along with his wife Barbara and their children. The whereabouts of Jane who would have been aged 19 and James who would have been aged 16 is currently unknown. His occupation is given as "Overseer" which was on behalf of Robert Sproul Crawford Aitcheson Alexander, the owner of Airdrie House itself and much of the surrounding land, and one would imagine would have made Charles an important person locally. Although his address is given as Airdrie House, this would not have been the main house but an adjunct to it. Around 1850 Charles made a trip to Western Kentucky in the USA seemingly at the behest of his employer, Robert Sproul Crawford Aitcheson Alexander, to join his eldest son Alexander, to explore the surrounding countryside looking for deposits of Iron ore. It appears that with in a few months they had accomplished this, and Charles returned to Scotland. Alexander remained in Kentucky, having married a local girl. Maria. Extracts from A History Of Muhlenberg County Chapter 20 Paradise Country And Old Airdrie relevnt to Charles Hendry and his son Alexander and their relationship with Robert Sproul Crawford Aitcheson Alexander. Alexander Hendrie was Alexander's geologist (Robert Sproul Crawford Aitcheson Alexander) . His father, Charles Hendrie, sr., was manager of the estates belonging to the House of Airdrie. Alexander Hendrie, or "Scotch Henry," was born in Airdrie, Scotland. June 24, 1820. In 1848 he came to the United States in search of iron ore for Alexander. In 1850 he located in Paducah, where by prearrangement he met his father, with whom he made an exploration of the deposits of iron ore in Western Kentucky. In the course of a few months they began an investigation of the Buckner Furnace tract and there found the ore that they considered was what they were looking for. Their recommendation of the iron ore found on this tract resulted in Alexander's buying the place in 1851. Certainly Charles was back in Scotland by the April of 1851 as he was recorded along with his family again at Airdrie House for the 1851 census. Jane missing from the 1841 census was recorded in the household this time around, but his sons Alexander, James and William were not. As already stated Alexander had emigrated to the USA. William had also emigrated to the USA, according to later census records in 1849. (Possibly with his brother?) James was somewhat closer to home having married and set up as a Iron Founder in Byers Foundrie, Kilwinning, Ayrshire. For the 1861 census James and Barbara were again recorded at Airdrie House, but specifically identified as residing in the "Factor's House". Charles's occupation was listed as Provost and J.P. which surely must have ranked him as a "Prominent Citizen" if not a "VIP"! His eldest daughter Jane and second youngest Bethia were recorded in his household, along with two "visitors" Agnes H. Shaw aged 23 and Henrietta Shaw aged 1. These individuals were in fact his youngest daughter Agnes, who had married a John Shaw on 5 March 1858 in New Monkland, Lanarkshire, and her infant daughter, and his granddaughter, Henrietta. Barbara Hendrie, nee Clydesdale, died on 15 January 1866 at Victoria Place, Airdrie. The Glasgow Herald of the following day carried a notice of her passing. Charles Hendrie died in the same year on 13 November 1866 aged 76 at 12 Victoria Place, Airdrie. He was identified on his death certificate as formerly a Factor and Coal Master and the Widower of Barbara Clydesdale. The names of his parents were not recorded although the informant was James Hendrie, son. The couple were commemorated on a headstone in New Monklands Cemetry. The Glasgow Herald of 15 November 1866 carried a notice of Charles's passing. Charles Hendrie his wife Barbara Clydesdale, his daughters Bethia Pearson Hendrie, Margaret A Hendrie, and Jane A Hendrie, along with Jane's husband George Thomson, were all commemorated on a headstone in New Monkland churchyard, Glenmavis. The birth of Robert Hendrie to John Hendrie and Agnes Frazer on 2 June 1793 in Gartmillan Farm, New Monkland, Lanarkshire was recorded in the New Monkland Old Parish Register. Tthe later death certificate of Robert confirmed him as the son of John Hendrie, a Labourer, and Agnes Hendry, maiden name, Fraser. John Henry born \ baptised 27 February 1814, New Monkland, Lanarkshire. Nothing more currently known. James Henry born \ baptised 10 November 1816, New Monkland, Lanarkshire. William Henry born \ baptised 14 February 1819, New Monkland, Lanarkshire. Nothing more currently known. Hugh Henry born \ baptised 08 April 1821, New Monkland, Lanarkshire. Janet Henry born \ baptised 09 March 1823, New Monkland, Lanarkshire. Agnes Henry born \ baptised 15 May 1825, New Monkland, Lanarkshire. Robert Henry born \ baptised 30 March 1828, New Monkland, Lanarkshire.. Nothing more currently known. Alexander Henry born \ baptised 28 March 1830, New Monkland, Lanarkshire. Charles Hendry born \ baptised 15 August 1832, Saint Cuthberts, Edinburgh, Midlothian. Presumed to have died in infancy as a second child named Charles recorded as born to Robert and Janet 20 months later. Going by the places of birth of the children of Robert and Janet, the family seem to have moved from Airdrie to Edinburgh around 1831. Robert also seems to have changed occupation over the years being identified as "Weaver" on the birth entry for his son Hugh in 1821 in New Monkland, then as a "Shopman" on the birth entry for his son Charles in 1834 in Edinburgh, and latterly as "Police Officer" recorded in the 1841 census. His children were recorded living at 6 New Street, Canongate, Edinburgh, Midlothian. However the mother Janet is missing from the census which would suggest she had passed away sometime between the birth of their daughter Ann in the November of 1836 and the date of this census. Their son Charles whose birth was recorded in the April of 1834 is also not recorded in the household which again might suggest his death in infancy. For the census of 1851 Robert was recorded with his family living at 7 St Marys Wynd, Edinburgh, Midlothian still employed as a Police Officer. The Robert and James Halady (Halliday) listed as "Grandsons" were in fact the children of his unmarried daughter Janet by a Robert Halliday. This relationship was recorded on both the later marriage (1870) and death (1919) certificates of Robert Halady the elder of the two children where his parents were identified as Jessie or Janet Hendry and Robert Halliday, Police Officer \ Letter Press Printer (not married). The father Robert is recorded as "deceased" on his 1870 marriage whereas his mother, Janet, is not. For the census of 1861 Robert was recorded living wih his new wife at 166 High Street, Edinburgh. What is almost certainly Robert's daughter Agnes is living alongside her father despite the age being incorrect . (It should be 35). She was however recorded as in a seperate household, hence the classification - "Head"
Robert Hendrie died aged 72 on 4 Mar 1865 in 166 High Street, St Giles Edinburgh. His death certificate recorded him as a Gardener, the widower of Alison Thomson, previously married to Janet Ritchie, and the son of John Hendrie, a Labourer, and Agnes Hendry, maiden name, Fraser, both identified as deceased. The informant was J. Hendrie, Tobacconist, Son, 1 Arthur Street, Pilrig, Edinburgh.